We have many exciting new classes coming up, including five new ones from Rami Kim. Three of her classes will be in December, so be sure to check them out below. You could make some fantastic gifts! Other teachers are Sue Rohrke, Martha Kunkel, Judy Sisneros, and, of course, our very own Judy Cummings! We will have a Sample Sale on Saturday, November 30. 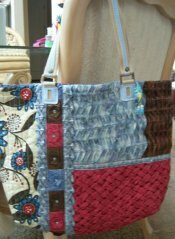 There will be lots of beautiful quilts of all sizes, purses, and much more, so mark your calendar. Selected Fall fabrics are now on sale at 30% off. 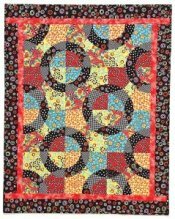 You still have time to make beautiful quilts, placemats, wall hangings, and more to decorate your home and give as gifts, so come in soon and make your selection. Remember to come by and pick up your kit for our 4th Annual Stocking Challenge! You buy a kit for $3 (containing a pattern and fabric to make a stocking), you sew the stocking together, and then you decorate/embellish it using more fabric, buttons, ribbon, lace, bells...anything you want to make it unique, fun, and festive. You bring it back to Thistle Dew (by November 30), we give it a number, and hang it up. For the next two weeks, customers vote on their favorite ones. We fill the stockings with goodies and give them to CASA of Sacramento County. We use the money from the stocking kits to help pay for the candy and other treats we put in the stockings. CASA works with foster children; for more about them, click here: www.sacramentocasa.org Please help us make this another successful challenge. Thank you! Sit & Sew, Thu, Nov 14, 1:00 - 4:00 p.m.
Blankets for Preemies, Fri, Nov 15, 11:00 a.m. - 3:00 p.m.
Provence & Beyond BOM, Thu, Nov 21, 6:00 - 7:00 p.m.
Leanne's House, Mon, Nov 25, 9:00 a.m. - noon, -OR- Tue, Nov 26, 1:00 - 4:00 p.m. Hand Piecing, Tue, Nov 26, 9:00 a.m. - 11:00 a.m.
American Girl Doll Sit & Sew, Wed, Nov 20, 1:00 - 4:00 p.m.
Spiral Tree Skirt, Martha Kunkel, Fri, Nov 22, -OR- Sat, Dec 7, 10:00 a.m. - 4:00 p.m., $40, supply list. Make this stunning tree skirt using the 25" 9-degree ruler and a selection of four contrasting fabrics. If you took the Spicy Spiral Table Runner class last year, you already have the ruler! 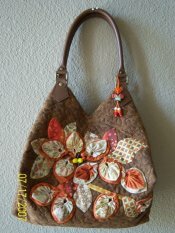 22-square Tote Bag with Folded Fabric Flowers, Rami Kim, Wed, Dec 4, 10:00 a.m. - 4:00 p.m., $40, supply list. Using 22 squares and folding techniques, we will create a one-of-a-kind beautiful tote bag. Depending on the size of your squares, you can create bags in various sizes. This is a cute project to show off and would make perfect gifts for your loved ones in this holiday season. 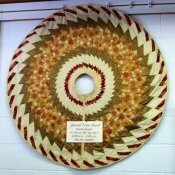 No-sew Tumbling Blocks Wall Hanging - Weaving Method, Rami Kim, Fri, Dec 6, 10:00 a.m. - 4:00 p.m., $55, supply list. You don't need to cut diamond pieces nor make set-in stitches to create perfect points for tumbling blocks. Depending on the width of your fabric strips you can make tumbling blocks in any sizes by weaving in three different directions. Come learn this fun technique to create a tumbling block quilt in a day. 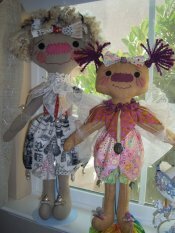 Fairy Raggedy Ann Dolls, Rami Kim, Fri, Dec 13, 10:00 a.m. - 4:00 p.m., $55, supply list. Make these adorable Fairy Annie dolls for your loved ones and yourself in this happy holiday season. Rami will show you how to create dolls and fairy costumes for raggedy dolls. Bring beautiful fabrics, beads, and charms you've been stashing to embellish dolls. If you use a Christmas-themed fabric, you can create a cute center piece for your party. 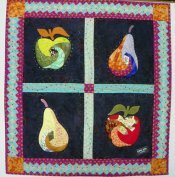 Apple & Pear Wall Hanging (Paperless Foundation Piecing), Rami Kim, Sat, Jan 4, 10:00 a.m. - 4:00 p.m., $55, supply list. Learn how to create these intricate twisted log cabin blocks in a variety of shapes using paperless foundation piecing. You do not have to tear out foundation paper! Machine trapunto adds dimensions to designs. 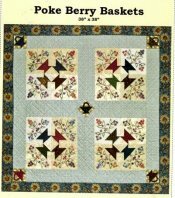 Hand Piecing - Poke Berry Baskets, Judy Cummings, 2nd Monday, Jan 13, Feb 10, Apr 14, May 12, 2014, 9:00 a.m. - Noon, $50. 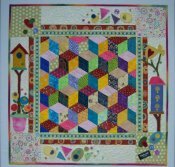 Graceful embroidery enhances the hand-pieced basket blocks in this 38" square quilt by Cindy Blackberg. You will use Cindy's technique to stamp, cut, and sew the blocks. Choose your fabrics and coordinating floss to make your own heirloom. Beginning Hand Embroidery, Judy Cummings, Tues, Jan 7 and Feb 4, 2014, 9:00 a.m. - Noon, $25, supply list. Learn to do the basic hand embroidery stitches and create a charming sampler. 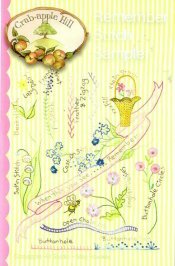 Floral Fusible Applique, Sue Rohrke, Fri, January 24 and 31, 2014, 10:00 a.m. - 3:30 p.m., $55, supply list. In this class, you will learn a really fun technique that will enable you to design your own art quilts from digital photos that you have taken yourself. It's liberating! This is a simple project for beginners and above. You can choose one of the three designs pictured here to make in class. Circle Pizzazz, Judy Sisneros, Sat, Feb 22, 2014, 10:00 a.m. - 4:00 p.m., $60, supply list. Judy's inspiration for this class began with the 'snake trail' block, which she has taught for years as "Winding Paths" - a great design. She wondered what would happen if she made the block and then re-cut it, made a little change, and then remade the block. It was wonderful! Plus, with the 'planned-overs' you have pieces to make a second quilt. Come spend a fun, instructional day with Judy and make your own unique pizzazz quilt. Templates are available for purchase. Intermediate level. 22-square Tote Bag with Folded Fabric Flowers, Rami Kim, Sat, Jan 25, 10:00 a.m. - 4:00 p.m., $55, supply list. Using 22 squares and folding techniques, we will create a one-of-a-kind beautiful tote bag. Depending on the size of your squares, you can create bags in various sizes. This is a cute project to show off and would make perfect gifts for your loved ones in this holiday season.